BUENOS AIRES, Argentina (CNN) -- After 16 hours of debate, Argentina's Senate passed a controversial reform law Saturday that critics say targets media outlets critical of the government. 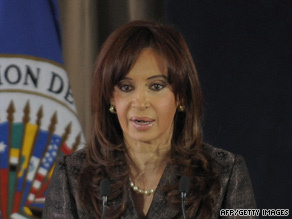 Argentine President Cristina Fernandez de Kirchner saw her party suffer political losses earlier this year. The 44-24 vote is a victory for Argentine President Cristina Fernandez de Kirchner, who had pushed to change the way the media operates in the South American nation after her party suffered devastating political losses earlier this year. Kirchner blamed media coverage, especially by conglomerate Grupo Clarin, for her party's defeats. The law approved by the Senate calls for the creation of a regulatory agency and spells out ownership rules regarding how many and what kind of outlets one company can hold. Kirchner sent the media bill to Congress in August and, according to the government, its intent is to diversify the public airwaves. The Argentine Congress passed the bill last month by a vote of 147 to 4, though the wide margin did not reflect the heated debate over it. Congressmen opposed to the measure protested by walking out of the chamber and not voting. Some threatened to turn to the courts to challenge the legitimacy of the vote. According to the Committee to Protect Journalists, the bill divides the airwaves in three parts: A third of broadcast concessions would be allocated to private companies, a third to state broadcasters; and a third to nonprofit organizations. The bill would limit the number of licenses a company can hold, and it would set quotas for national programming. The CPJ said "many Argentine journalists and free press advocates acknowledge a need to overhaul broadcasting regulations enacted in 1980, during military rule, but have concerns about this bill." CPJ, a nonprofit organization that promotes press freedoms worldwide, found that provisions in the Argentine bill could restrict freedom of expression, particularly an article that gives the president authority to appoint most members of a new broadcast regulatory body. "We believe that the regulator must be autonomous and independent to ensure that broadcast concessions are not subjected to political interference," said Carlos Lauria, CPJ senior program coordinator for the Americas, in an article posted on the CPJ Web site.